Alexander Industries was founded in 1963 and acquired by the current owner John Ryan in 1990. 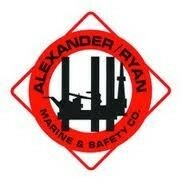 The name was changed to Alexander/Ryan Marine & Safety Company. We are an ISO 9000 Compliant Company, supplying a complete line of Marine Safety and Fire Protection Products to Energy Companies, Engineering Firms, Drilling Contractors, Shipyards, and Supply Companies Worldwide.
. For use with MOB-signals and a quick release ring buoy bracket. All Datrex rings are molded from high impact linear low-density polyethylene for superior life expectancy in the most severe environments. The encircling rope is replaceable. Designed and built in accordance with SOLAS 1974 and its amendments and INTERNATIONAL LIFESAVING APPLIANCE (LSA) CODE.